Heat the oil in a large saucepan, add the garlic and cook for two minutes until it turns golden. Add the chili flakes and tomatoes, season well, and simmer for 15 minutes until the sauce is thick and reduced. While the sauce is cooking, cook the pasta following pack instructions add the kale for the final two minutes of cooking. Drain well and stir into the sauce, then divide between 4 bowls. 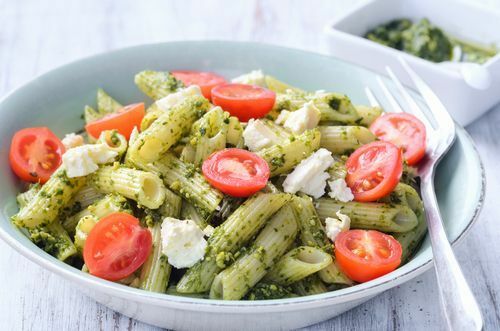 Top each with a dollop of ricotta, a drizzle of pesto and shavings of Parmesan, if you like.